A day after the deadliest mass shooting in modern U.S. history, White House press secretary Sarah Huckabee Sanders deflected reporters' questions about gun control by saying "there will certainly be a time for that policy discussion to take place, but that’s not the place that we’re in at this moment." Yet the topic was by then already top of mind across the country, according to an analysis of Americans' online searches. 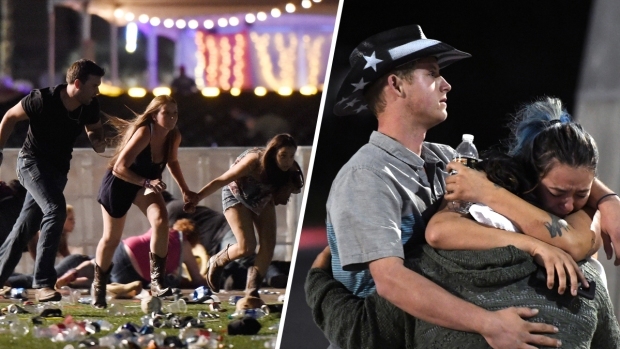 Within hours of gunman Stephen Paddock opening fire on a crowd of concertgoers at the Route 91 Harvest Festival in Las Vegas, search interest in "gun control" spiked across the country, according to data compiled by Google Trends. At 3 a.m. ET Monday, about three hours after Paddock began spraying the crowd with a barrage of bullets from the 32nd floor of the nearby Mandalay Bay hotel, search interest in "gun control" surpassed search interest in "gun shop." It was the first time that has happened in nearly a year. Since Sunday night’s attack that left 58 people dead and scores more wounded, search interest for "gun control" has maintained its dominance over "gun shop" in nearly every state accept Kentucky. Queries for gun stores has regained popularity there. Search interest in "gun rights" has plateaued over the last decade and remained unchanged in the last six days. It is not clear if the shift in search term interest reflects a shift in attitudes toward gun ownership. Google Trends makes no speculation as to whether the searches for "gun control" during this time were for, against or just seeking information on the topic following the shooting. The trend also appears to be common after such attacks. Spikes in searches for "gun control" following the San Bernardino, California, Virginia Tech and Sandy Hook massacres also occurred while "gun shops" has maintained popularity among Americans over the long term. A recent national survey by the Pew Research Center found that 81 percent of Americans support expanding background checks, 76 percent support laws that would prevent the mentally ill from buying guns, and 71 percent are for barring people on the “no-fly” list from purchasing guns. About half support bans on assault-style weapons — 52 percent — and high-capacity ammunition clips. The poll, conducted in August, showed a partisan divide on banning assault weapons. Fewer Republicans, 35 percent, favor an assault weapons ban compared to 67 percent of Democrats. Yet gun control measures have been essentially off the table in Congress since a bipartisan deal to expand background checks — forged in the wake of the killing of 26 people, including 20 elementary school children, in Newtown, Connecticut — failed in 2013. In a rare concession for the National Rifle Association, the nation’s largest gun lobby embraced regulations on “bump stocks,” the device found on several of the Las Vegas shooter’s guns. Paddock appeared to have used bump stocks to covert semi-automatic weapons into fully automated ones. The NRA, which famously opposes virtually any hint of new restrictions, said in a statement: "The National Rifle Association is calling on the Bureau of Alcohol, Tobacco, Firearms and Explosives (BATFE) to immediately review whether these devices comply with federal law. The NRA believes that devices designed to allow semi-automatic rifles to function like fully automatic rifles should be subject to additional regulations." President Donald Trump, who has declared himself an ardent backer of gun rights and has moved to roll back some of the executive actions President Barack Obama took to tighten access, agreed. 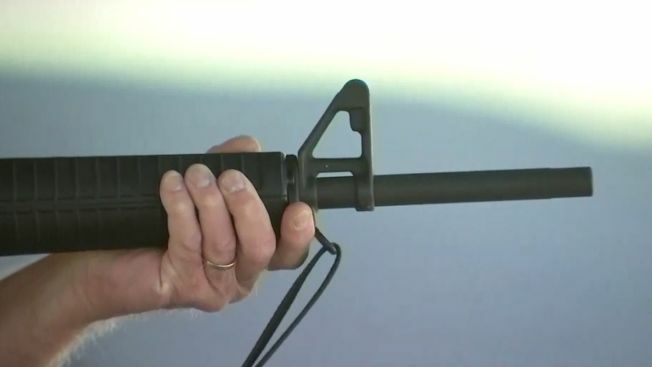 "Obviously we need to look at how we can tighten up the compliance with this law so that fully automatic weapons are banned," the Wisconsin Republican told reporters at an event in Chestertown, Maryland. Sen. Dianne Feinstein, a California Democrat, introduced a bill Wednesday to ban bump stocks and other devices that can enable a rifle to fire as many as 400 to 800 rounds per minute. More than 20 Democratic have signed on as co-sponsors. U.S. Rep. David Cicilline, a Rhode Island Democrat, said he introduced a similar bill Wednesday in the House of Representatives. The Republican-controlled Congress has not taken up new gun restrictions in light of recent mass killings. And before Sunday's shooting, House GOP leaders had been moving forward with bills to ease regulations on gun silencers and allow people with concealed-carry permits to take their weapons to other states. A vote on the bill has been delayed. Meanwhile, gun control advocates have shifted much of their campaign for tighter firearms laws to the states — and they've chalked up some modest, unexpected successes. Republican governors in Nevada, North Dakota, Tennessee, Utah and New Jersey all have signed bills this year tightening access to guns. At the same time, efforts to loosen restrictions have failed in several states where Republicans are in control. 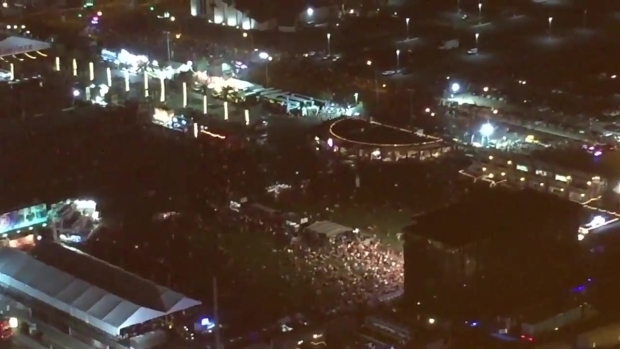 Video shows people feeling a country music festival in Las Vegas after a gunman opened fire from inside the Mandalay Bay Resort and Casino. Authorities said that more than 50 people were killed and more than 500 wounded. The gains expose revealing limits to what some had felt was the virtually unlimited influence of the gun lobby. Some GOP state officials have shown a willingness to break ranks — largely on incremental steps — tacking closer to overall public opinion about a need for some curbs on gun purchases, broader background checks and limits on where guns can be carried. Hoping it's at least a mini-trend, gun control advocates say they plan to exploit newly fertile ground in the wake of the Las Vegas shootings.